WSU employs only U.S. citizens and aliens who are authorized to work in the U.S. in compliance with the Immigration Reform and Control Act of 1986. All new employees including U.S. citizens must present an original document or documents that establish identity and employment authorization within three business days of the date employment begins (also referred to as the hire date). For questions, contact Human Resource Services (HRS); telephone 509-335-4521. Only a designated WSU representative may complete the U.S. Citizenship and Immigration Services (USCIS) Employment Eligibility Verification (Form I-9) by examining and verifying the documents presented by a new employee. Designated representatives include employing officials and their designees. See BPPM 60.10 for definition of employing official. Employing officials must be prudent in designating WSU personnel who are authorized to complete the Form I-9, since employees who examine the identifying documents are certifying under penalty of perjury that the documents appear to be genuine. Civil and criminal penalties apply for violation of these requirements. Select M-274, Handbook for Employers. The application forms for administrative professional, civil service, collective bargaining unit, and temporary employment positions indicate WSU’s compliance and include the above statement. Letters from departments to prospective faculty employees acknowledging receipt of applications include the above statement. Employing departments document verification of eligibility on USCIS Employment Eligibility Verifications (Form I-9). See below for employee and employer procedures for verifying employment eligibility and completing the Form I-9. Employees who were employed by WSU on or before November 6, 1986, and are still employed without a break in service do not have to establish their eligibility for U.S. employment as required in this section. If the employee has more than one WSU appointment, only one Employment Eligibility Verification (Form I-9) is to be filed at HRS. Temporary hourly and student hourly employees. This procedure does not apply to nonpaid adjunct appointments (also referred to as courtesy appointments) and nonservice pay. If the duties are performed in a foreign country, employees do not have to establish their eligibility for U.S. employment as required in this section. If employees return to the U.S. for any purpose, Form I-9 must be completed. Under Electronic I-9 System (Lookout Services), select Log-in. NOTE: The department employee logs into Lookout Services by using the username and temporary password provided by HRS. The employee must establish a unique password with Lookout Services to access the online I-9 system. Contact HRS to receive access to Lookout Services. 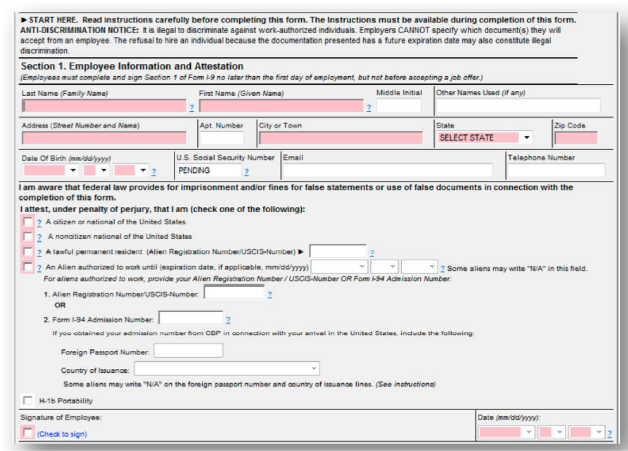 No later than the first day of employment, the newly-hired employee must fully complete, date, and electronically authorize Section 1 (Employee Information and Attestation) of the Form I-9 (see Fig. 1). The employee may complete Section 1 prior to his or her first day of work. The department may not require an employee to provide his or her social security number (SSN) for the purposes of completing Section 1. If the applicant does not provide an SSN, departmental personnel enter Pending when prompted on the online form. A designated WSU representative must fully complete, date, and electronically authorize Section 2 (Employer Review and Verification) of the new employee’s Form I-9 within three business days of hire (see Fig. 2). Designated representatives include employing officials and their designees. See BPPM 60.10 for definition of employing official. The employee presents to the representative documents of his or her choice from the lists included with the online Employment Eligibility Verification (Form I-9). Presented documents are to be originals. Photocopies or fax copies are not acceptable. The designated WSU representative examines and verifies the original documents presented by the new employee. NOTE: The designated departmental representative must view and verify the required employee documents. However, the department does not submit employee documents to HRS or retain copies. If the new employee is unable to produce original documents or receipts for documents within three business days of hiring, employment must be terminated. Contact HRS for assistance. Employees who never had an Employment Eligibility Verification (Form I-9) on file and separate from the University must complete the Form I-9 upon reemployment. The employee is still eligible to work on the same basis; e.g., citizenship, residency, or work authorization; as when the original Form I-9 was completed. When rehiring an employee, the department has the option of completing a new Form I-9. NOTE: If the rehired employee’s original Form I-9 was completed on a paper form, the department must complete a new Form I-9. 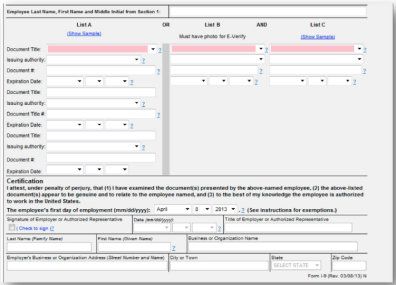 Rehired employees must complete a new Form I-9 if the previous form version has since been replaced by a newer version. 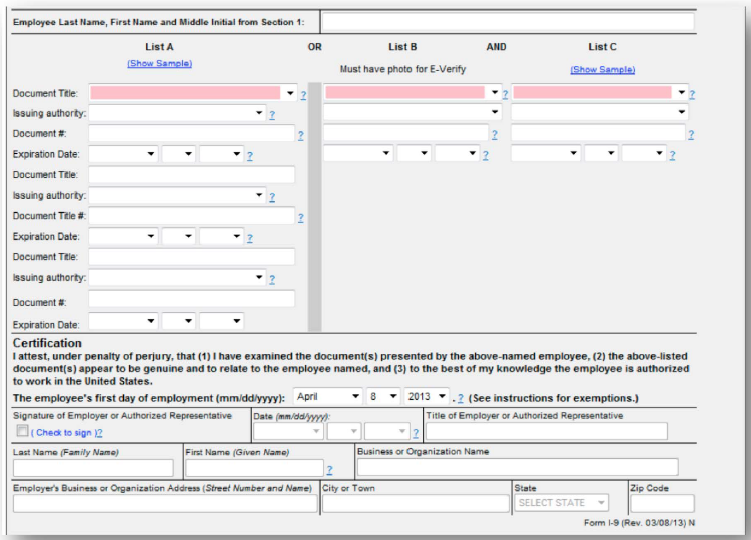 The version date is located on the lower righthand corner of the Form I-9. If the grant of work authorization used to complete the original Form I-9 is about to expire and the employee has received a new grant of work authorization, department personnel must reverify on Form I-9 to employ the person. Reverification must occur no later than the date that the employment authorization (or evidence thereof) expires. NOTE: If the original I-9 was completed on a paper form and the employee did not separate from University employment, the department must submit a paper Form I-9 with appropriate attachments for reverification to HRS. Employees must complete a new Form I-9 if the previous form version has since been replaced by a newer version. 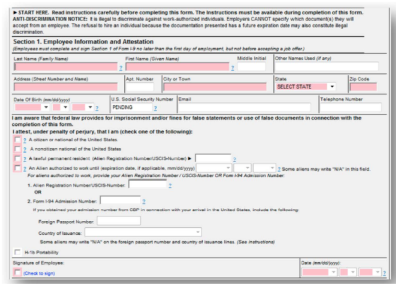 The version date is located on the lower righthand corner of the Form I-9. Although HRS monitors the work authorization expiration dates for non-U.S. citizens, departmental personnel are also responsible for monitoring the expiration dates. In order to ensure uninterrupted employment, the department should start the process for extending an employee’s employment eligibility at least two months before the work authorization expiration date. The Lookout Services online I-9 system sends notices to employing departments 180, 90, 60, and 30 days prior to the work authorization expiration dates of I-9s submitted for non-U.S. citizens. Employing departments work with the employee, the Office of International Students and Scholars, and HRS to resolve employment eligibility, either with a change in immigration status, an extension of employment eligibility, or termination of employment. The Office of International Students and Scholars notifies HRS and Payroll Services when a change in the U.S. Citizenship and Immigration Services (USCIS) status of a University employee occurs. If a non-U.S. citizen’s employment eligibility expires with no extension, the employing department works with HRS to process a personnel action through the online Personnel/Position/ Payroll Electronic Routing Management System (PERMS) to terminate employment. For the temporary employment program, if a non-U.S. citizen’s employment eligibility expires, the employing department cancels the appointment through the Positive Pay Time Entry screen in the DEPPS or HEPPS Administrative Information System or through the online Temporary Employment System (TEMPS) (see BPPM 55.22 and 60.27). For a new employee who is unable to travel to the department’s location to complete the Form I-9, the hiring department should contact HRS to make arrangements for a remote I-9 process. The I-9 form may be completed by a designated WSU representative only.